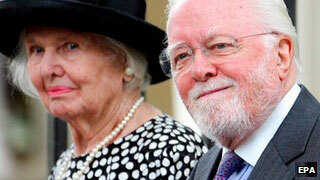 Lord and Lady Richard Attenborough. 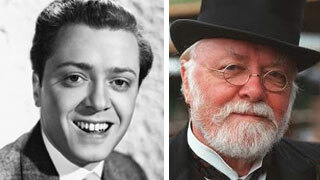 Lord Richard Attenborough, who died August 24th just days short of his 91st birthday, might not be familiar to viewers of Afternoon Tea, but he had a great impact on those who appear in the shows. Unlike his younger brother, broadcaster and naturalist Sir David, Attenborough rarely was seen on television. He began his acting career in 1942, but didn't make his television debut until 2001, when he starred as the Old Gentleman in the Masterpiece Theatre presentation The Railway Children. Attenborough did, however, work tirelessly behind the scenes. He was the founding Chairman of the BBCs Channel 4 and was instrumental in raising funds for the British Film and Television Industry. 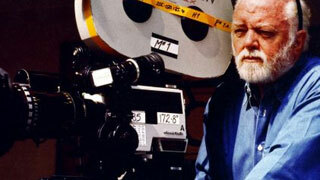 According to multiple Oscar award winning producer Lord Puttnam, "Every single human being working in today's film and television industry owes Dickie Attenborough maybe their entire careers." It was Attenborough for instance who persuaded former Prime Minister John Major to include film investment as part of the U.K. lottery money distribution, which in turn transformed the country's film industry. A few years earlier, he had gotten Margaret Thatcher to agree to hold a British film industry "summit" at 10 Downing Street. At the time, the British film industry was in a severe decline, but after the meeting the government implemented greater tax breaks for British made films. Attenborough's film directing credits include Gandhi in 1982 which earned eight Oscars, including that of Best Director and Best Film, beating out E.T. which Attenborough personally felt should have won. He would become good friends with E.T. director Stephen Spielberg, who in 1993 cast Attenborough as the billionaire creator of Jurassic Park. granddaughter Lucy Holland in 1997. Although not known for his stage work, as a young man, Attenborough had received a scholarship to attend the Royal Academy of Dramatic Art (RADA), where he trained as an actor. He was Chairman of the school from 1973-2003, at which time he took over as President; a position that had been vacant since the death of Princess Diana in 1997, who had held the role since 1989. Despite an age gap of 38 years, Diana and "Dickie" as she called him, were the best of friends. They met in 1985 after Prince Charles asked Attenborough to tutor Diana in the art of speech making as talking in public was causing her "a great deal of anxiety." Attenborough and the Princess met every other week and even after his tutoring was no longer needed, they remained close. appeared in The Railway Children. Attenborough held the position of President of RADA until his death. The school meant the world to him. It was there that he'd met his wife, actress Sheila Sim, with whom he went on to appear in the original production of the world's longest running play Agatha Christie's The Mousetrap. At the time of his death the couple had been married for 74 years. They had three children, two girls and a boy. Sadly, their eldest daughter, her 13 year old daughter Lucy and her mother-in-law, were killed in the devastating Tsunami of December 26th 2004. For the last few years of his life, Attenborough lived with his wife in Denville Home, a retirement home for people in the performing industry. Lady Attenborough had moved into the home in 2012 after being diagnosed with senile dementia and she was joined by her husband, who had suffered a debilitating stroke in 2008, less than a year later.